Tam will be at the Candleriggs Market, Glasgow on Saturday 1st and Sunday 2nd September 2018 to launch his latest collection, Caress Every Love That I Cherish. This brings together for the first time Tam’s most popular Celtic poems in a deluxe 128 page A4 hardback book. It’s full colour throughout, and makes the perfect gift for any Celtic fan. Tam will be launching his latest collection of poems, ‘A Capricious Capricorn’ on Saturday 17th and Sunday 18th March at the Candlerigg’s Market. The book is on sale here in the shop ». Tam is delighted that a framed version of his poem ‘The Lisbon Lions’ is now on permanent display at the Scottish Football Museum at Hampden Park, Glasgow. The museum is one of Glasgow’s top attractions and is home to the world’s most impressive national collection of football related objects, memorabilia and ephemera. Tam is delighted that he will be doing a Book signing including his latest work ‘The Greatest’ at Easons bookshop, Shopping Centre, Letterkenny, Eire on Saturday 18th March 11am to 2pm. Tam is delighted that his collection of Celtic A1 posters are now on display at the Hampden Park Shop. The posters can be ordered online, or at the Candleriggs Market on a Saturday and Sunday. The shop is open to the public at Hamden Park Stadium, where you can also visit the Scottish Football History Museum, part of the Hampden Experience. Tam is delighted to have a exhibition of his poems running until the end of July 2016 in the Regent Shopping Centre, Kirkintilloch. 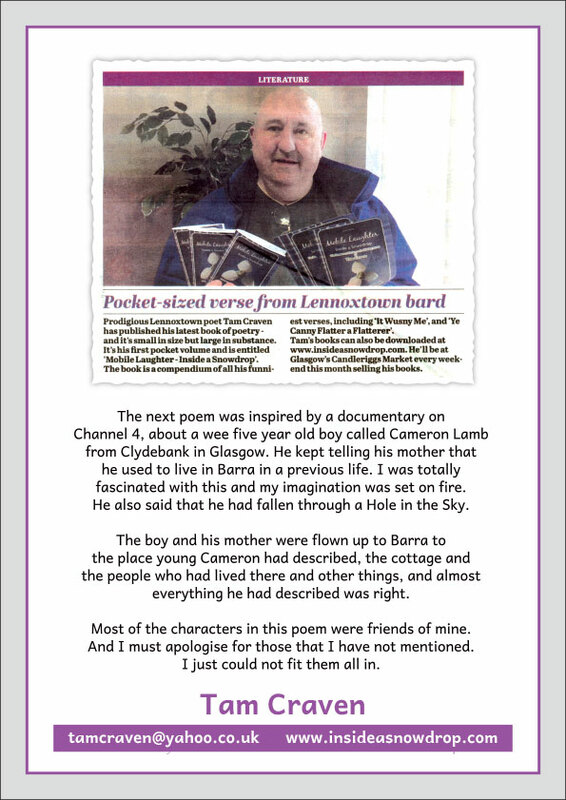 It features beautifully framed versions of a section of his most popular poems, and was featured in this week’s Kirkintilloch Herald. Click the main image above to read the newspaper article. Tam will be appearing as our guest at the East Dunbartonshire Older Peoples’ Spring Fayre to be held on Friday 29 April 2016 in Woodhill Church, Bishopbriggs from 10 am. For full information you can download the promotional flyer HERE. Tam Craven recently appeared in the Kirkintilloch Herald. Here is a clipping from the newspaper. Tam will be speaking at Bishopbriggs Library, 29th April.